Brunetto Latini appears in Inferno XV among the sodomites in the seventh circle of Hell. Readers often notice the tenderness Dante exhibits toward his mentor and the affection Brunetto expresses for Dante. Brunetto employs “son” [figliuol] as a term of endearment during their encounter (XV.31, 37), and Dante describes walking beside Brunetto “with head bent low as does a man who goes in reverence” [ma ‘l capo chino tenea com’ uom che reverente vada] (XV.44-45). While Dante uses the formal second person pronoun “voi” to address his mentor, Latini speaks to Dante using the informal “tu,” signifying Dante’s deference to Latini. At the end of the canto Brunetto pleads, “Let my Tesoro, in which I still live, be precious to you; and I ask no more” [Sieti raccomandato il mio Tesoro nel qual io vivo ancora, e più non cheggio] (XV.118-120). “Tesoro” is the Italian word often used for Latini’s encyclopedic work, Li Livres dou Trésor, but could also be a reference to his poem, the Tesoretto. Dante and Brunetto Latini. 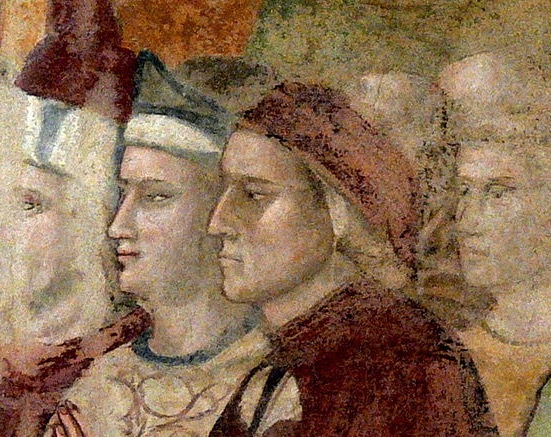 Fresco of San Bargello, attributed to Giotto. The Tesoretto is often recognized as a precursor to Dante’s Divine Comedy. The poem follows in the medieval tradition of philosophical poetry in which a narrator recounts a dream-like vision. Latini’s poem, like Dante’s, even begins with his protagonist lost in dark wood: “And I, in such anguish, thinking with head downcast, lost the great highway, and took the crossroad through a strange wood” [E io in tal corrocto/pensando a cap chino/perdei il gran cammino/e tenni a la traversa/d’una selva diversa] (184-189). Latini also carefully inserts himself into a poetic tradition within the course of his poem. Dante certainly would have known this work (some argue that he may have even been the scribe of the Strozzi 146 manuscript) and his self-presentation in the Comedy clearly draws inspiration from Brunetto. In the Tesoretto, Brunetto defers to the love poet and philosopher Ovid. When Latini encounters him, he asks Ovid to instruct him in matters of love, personified by Cupid: “And [I] asked the man himself that he should openly tell me the workings both the good and the evil, of this child with wings” [E domandai lui stesso/ch’elli apertamente/mi dica il convenente/e lo bene e lo male/del fante e dell’ale] (2364-2369). The manuscript portrays the relationship between the two poets with an illustration of Ovid at an imposing writing desk and Brunetto standing before him as his student. Ovid appears older and more commanding than Brunetto and his place at the desk further emphasizes his position of power. The image is also an inversion of the opening illustration of the manuscript, which depicts Latini occupying the place at the writing desk, instructing his own reader. In fact, after his encounter with Ovid, Latini declares: “But Ovid through artistry gave me the mastery, so that I found the way from which I had strayed.” [Ma ovidio per arte/mi diede maestria/si ch’io trovai la via/ ond’io mi traffugai] (2390-2394). Although Brunetto recognizes his predecessor, he ultimately asserts his own authority as a poet. Brunetto Latini before Ovid. Strozziano 146, Fol. 21v. Biblioteca Mbedicea-Laurenziana. 13th century. Dante employs a similar method in Inferno IV when he encounters the great poets in Limbo. Among Virgil, Homer, Horace, Ovid and Lucan, Dante claims his place: “I was sixth among such intellects” [sì ch’io fui sesto tra cotanto senno] (IV.102). Dante also recognizes his debt to Brunetto as his teacher: “your dear, your kind paternal image when, in the world above, from time to time, you taught me how man makes himself eternal” [la cara e buona imagine paterna di voi quando nel mondo ad ora ad ora m’insegnavate come l’uom s’etterna] (XV.83-85). However, the relationship in the Comedy that most reflects this link to the poetic tradition is that of Dante and Virgil. In the Inferno, Dante recognizes Virgil as his “author and master” [Tu se’ lo mio maestro e ‘l mio autore] (I.85). Virgil serves as Dante’s guide throughout the Inferno and Purgatory but eventually Dante leaves him behind, as he ascends when Virgil cannot. On the final page of the Tesoretto manuscript, we find Brunetto Latini upon a horse, pointing towards a model of the earth, which is surrounded by the sea, then air, then fire. To his right is Ptolemy, identified as tolomeo filosofo. 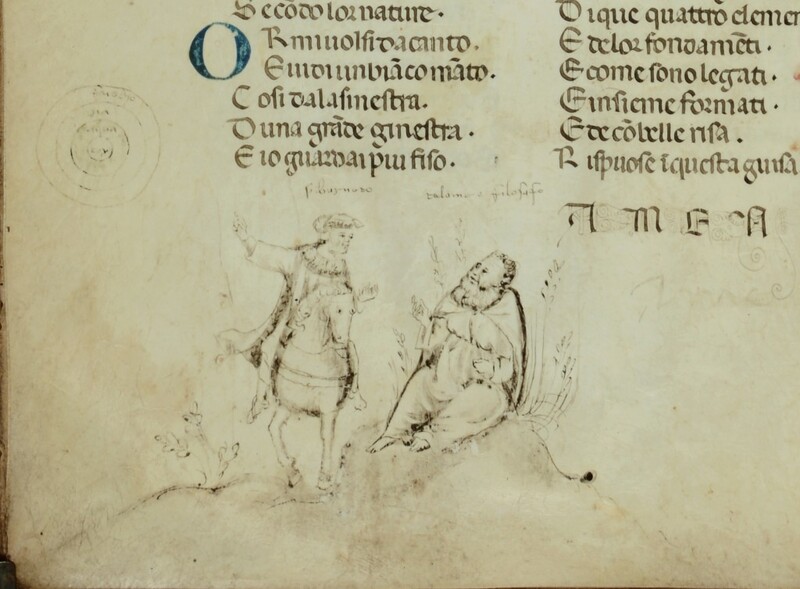 Dante acknowledges Ptolemy in the Convivio (Book II, Ch. 14): “In the Old Translation he [Aristotle] says that the Galaxy is nothing but a multitude of fixed stars in that region… Avicenna and Ptolemy seem to share this opinion with Aristotle.” We also find echoes of the Ptolemaic conception of the universe throughout the Comedy. Through Dante’s reference to Latini, we find an archive of sources that influenced both poets’ works. Baldwin, Spurgeon and Paul Barrette. Introduction to The Book of the Treasure (Li Livres dou Tresor) by Brunetto Latini, translated by Spurgeon Baldwin and Paul Barrette. New York: Garland Publishing, Inc., 1993. Giola, Marco. La tradizione dei volgarizzamenti toscani del <<Tresor>> di Brunetto Latini. Verona: QuiEdit di S.D.S. s.n.c, 2010. Holloway, Julia Bolton. Introduction to Il Tesoretto by Brunetto Latini, edited and translated by Julia Bolton Holloway. New York: Grand Publishing, Inc., 1981. Inglese, Giorgio. “Latini, Brunetto.” Dizionario Biografico degli Italiani, vol. 64, 2005. (http://www.treccani.it/enciclopedia/brunetto-latini_(Dizionario-Biografico)/). Kay, Richard. “The Sin(s) of Brunetto Latini.” Dante Studies, with the Annual Report of the Dante Society, no. 112 (1994):19-31. Mazzoni, Francesco. “Latini, Brunetto.” Enciclopedia Dantesca, 1970. (http://www.treccani.it/enciclopedia/brunetto-latini_(Enciclopedia-Dantesca)/). Roux, Brigitte. Mondes en miniatures: l’iconographie du Livre du trésor de Brunetto Latini. Genéve: Libraire Droz S.A., 2009.